Decorative Life: Many weeks to months. Under right environmental conditions, numerous flowers can be present nearly all the time. Biggest production problem is to get predictable and uniform flowering as the precise cultural requirements are still being developed. Related species include gentian, exacum or Persian violet and African violet. Flowers tubular, in clusters at stem ends. Plant is often vine-like, leaves are fleshy. This species is classified as an epiphyte (living on other plants but not parasitic, like many orchids). The specific epithet name of “pulcher” means handsome, beautiful. From “aischyno”, to be ashamed, and “anthos”, flower, referring to the red flowers. 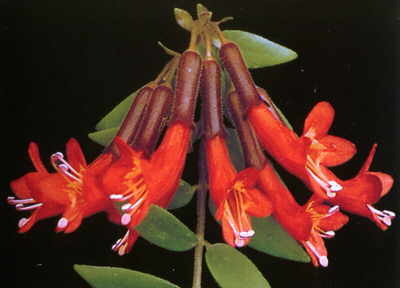 The cluster of flowers appearing on the ends of stems resemble a group of lipsticks, hence the common name. This species is classified as an “epiphyte” or air plant. It grows on other plants and elevated supports as subshrubs or vines. It is not a parasite but obtains water and nutrients through a spongy covering of their roots.